Prevent computer overheating while you work with this ENHANCE laptop cooling stand. The five fans send air flowing under and around the computer, while the handy scroll wheel lets you adjust the fan speed and light level. 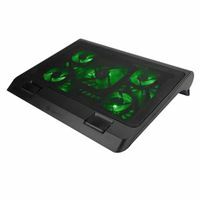 This oversized ENHANCE laptop cooling stand is height-adjustable, so you can easily change the viewing angle of the screen.